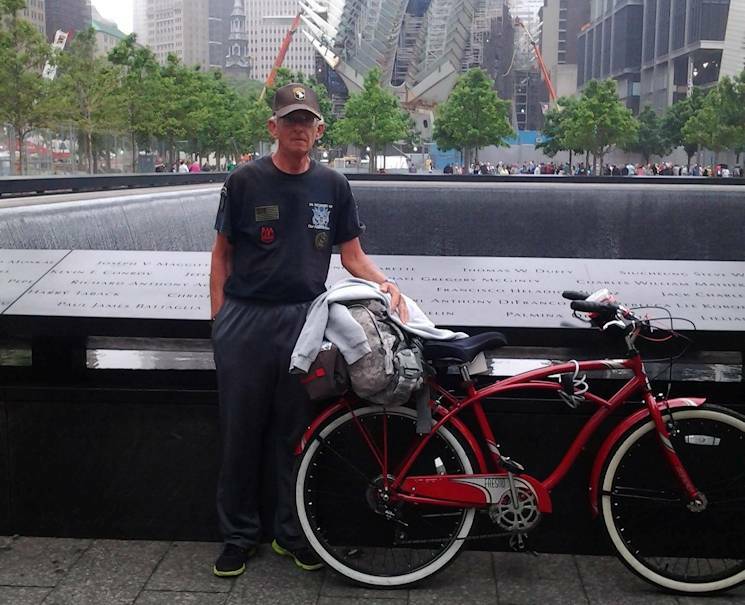 FORT BENNING, Ga. - At 63 years old, Harry Conner has found his purpose in life ... to ride his bicycle around the country and tell people about a true American hero. After eight years in the United States Army, Conner left the service as a staff sergeant in 1980. He entered the job market and worked managerial positions until one fateful day. That article, published Feb. 4, 2011, in the Orlando Sentinel in Florida, told of the heroic actions Cashe displayed while deployed to Iraq in 2005. Cashe's sister, Kasinal Cashe White, recalled the incident to the local reporter. While on patrol, Cashe, of Oviedo, Florida, was in the lead vehicle when an improvised explosive device detonated near his vehicle, Oct. 17, 2005. As fuel leaked from the vehicle, it caught on fire. Cashe and his Soldiers were trapped inside. Despite being covered in fuel, he worked to find an exit point and immediately began pulling the Soldiers out, one by one, as his body was being consumed by flames. By the time Cashe was able to be medically evacuated from the area, burns had covered more than 80 percent of his body. He would eventually be transported to Brooke Army Medical Center, the Department of Defense's only stateside Level I trauma center, in Fort Sam Houston, Texas. 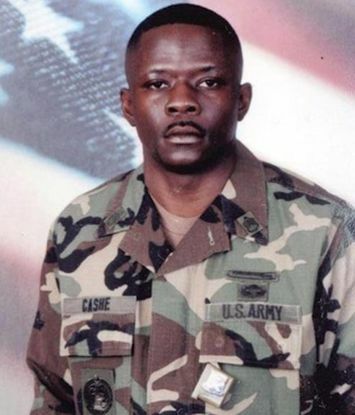 Despite the care Cashe received at the DoD Burn Center, on Nov. 8, 2005, three weeks after sacrificing his life to save his Soldiers, he died as a result of his injuries. He was awarded the Silver Star for his actions, the military's third-highest decoration for valor, awarded for gallantry in action against an enemy of the United States. Cashe also received a Bronze Star and Purple Heart during his service. Conner immediately felt a connection to the Soldier. Cashe served with Company A, 1st Battalion, 15th Infantry Regiment, 3rd Infantry Division, at Fort Benning, Georgia. Conner, too, served in the 3rd Infantry Division. He was assigned to the 1st Battalion, 10th Field Artillery Regiment, but was serving as the liaison noncommissioned officer for 1st Bn., 15th Inf. Regt., during his time in Schweinfurt, Germany, between 1974 and 1977. In 1978, Conner was assigned to Fort Sill, Oklahoma, as a drill sergeant. Cashe, too, served as a drill sergeant during his career. “The connection was ironic ... At the time of his death, the 3rd Infantry Division was [being relieved-in-place] by the 101st Airborne Division, which I had also served in,” Conner explained. Reading the story about this young man's life, Conner said he immediately felt the need to connect with his family. He e-mailed the article's author and was put in touch with the Cashe family. Conner said he has rallied with the family and Cashe's leaders, who continue to push for Cashe to receive the Medal of Honor. He also began touring the country on his bicycle, speaking to those who will listen and telling them of a man, a Soldier, a husband and a father whose actions on a dusty, 3 and one-half mile stretch of road outside of Forward Operating Base McKenzie, in Samarra, Iraq, were nothing less than heroic. In April of this year, Conner left Sanford, Florida, the final resting place of Cashe. On June 12, he arrived at Ground Zero, in New York, but not without complications. On his first day of the spring ride, Conner was hospitalized for heat exhaustion. “The doctor said I'm too old, but what does he know?” joked Conner, who continued on his trip. Although there were a few mechanical problems with the bicycle, he never quit. Following his stop at Fort Benning, Conner will bicycle to Fort Stewart, Georgia, where the 3rd Infantry Division is headquartered. Conner's mission remains the same — to tell people about the life and service of Sgt. 1st Class Alwyn Cashe. At the end of each cycle, trainees vote for the drill sergeant they feel best made them a Soldier and, Conner said, during one cycle more than 60 percent of them chose him. At the time, Cashe was the senior drill sergeant and did not have as much interaction with the young Soldiers but the time he did spend with them made a lasting impact. Conner's efforts involving Alwyn Cashe being recognized with the Medal of Honor can be followed at Facebook. Hathaway was Cashe's company commander in Company A, 1st Bn., 15th Inf. Regt., at the time Cashe was injured during the company's deployment to Iraq. Hathaway now works a short drive from the company's headquarters on Kelley Hill, serving as the operations officer in charge at for the Airborne and Ranger Training Battalion at Fort Benning, Georgia. He still remembers the leader who disregarded his safety for the sake of others in his company and continues to fight, alongside others who served with or knew of Cashe, for him to be awarded the Medal of Honor. All around the country, there are men who recall the type of leader and Soldier Cashe was and who will never forget that fateful day. “He was ...a country boy. Just a down-to-earth leader who everyone respected,” said Garett Alvey. Alvey was a sergeant and company sniper with 1st Bn., 15th Inf. Regt., and had interacted with Cashe on various missions the unit conducted in and around FOB McKenzie. On Oct. 17, 2005, Alvey was one of the Soldiers called on to help evacuate the wounded following the IED detonation. Alvey said the images, some too gruesome for anyone other than those there to comprehend, remain with him to this day. He is currently working as a senior consultant for the United States Marine Corps at the Mountain Warfare Training Center in California. Cashe was a man “who always had a hunting story to tell,” said Maj. Leon Matthias, Jr., who worked side-by-side with Cashe. Then-2nd Lt. Matthias served as his platoon leader, after Cashe's first platoon leader, then-1st Lt. James Ryan, had to redeploy for training. Five months into the deployment, Ryan received word from their battalion commander that he would need to return to the United States in order to complete his degree. As a sergeant first class, he had been accepted into Officer Candidate School with 90 credit hours but, by regulation, had to complete the remainder of his degree before achieving the rank of captain. “I felt guilty about leaving my guys over there...I sat down with Cashe and I said ‘hey look, I'm going to go talk to the [battalion operations officer] and the battalion commander about staying,” Ryan said. But Cashe immediately interjected and told his platoon leader that he needed to fulfill his duties in the classroom, telling Ryan that he would “be a fool” for staying and not finishing his education. Ultimately, Ryan returned to the states and, in the middle of working on his degree, learned about the incident that ultimately took Cashe's life. “That's weighed on me all of these years,” explained Ryan, who is now retired from the Army. Matthias said Cashe, above all, believed in service above self and was never concerned with personal or professional gain. Cashe rescued six Soldiers from their Bradley Fighting vehicle that day. Of the six, three died within weeks of the incident. Staff Sgt. George T. Alexander, Jr., of Clanton, Alabama, died Oct. 22, 2005. Sgt. Michael “Doc” Robertson, of Houston, died Oct. 25, 2005. Spc. Darren Howe, of Beatrice, Nebraska, died Nov. 3, 2005. Spc. Raymond Salerno III, who was also pulled from the vehicle, died of heart failure July 14, 2006, while under observation at Brooke Army Medical Center. Salerno had initially made progress in his care and returned home to Land O'Lakes, Florida, but returned to BAMC due to complications from his injuries.